Love is love. It’s a simple idea that so many people can’t grasp. Love is nothing to be afraid of. Black and white, boy and boy, girl and girl — or indeed, mouse and bear — it’s never anything to be afraid of. But it seems to only make sense to one inquisitive mouse, Celestine (Mackenzie Foy), and one hungry Bear, Ernest (Forest Whitaker), who meet quite by accident when Ernest saves Celestine’s life only to then try and eat her for a snack. In the film’s world that is inhabited by animals like Art Speigelman’s Maus, the other mice are afraid though, and the other bears. Mice live in underground, bears above ground, and the two share very little with each other. When Ernest and Celestine find themselves on the wrong side of the law in both the bear and mice world that notion is challenged in startlingly emotional ways and the unlikely pair find each other to be perfect protectors for each other in different ways. 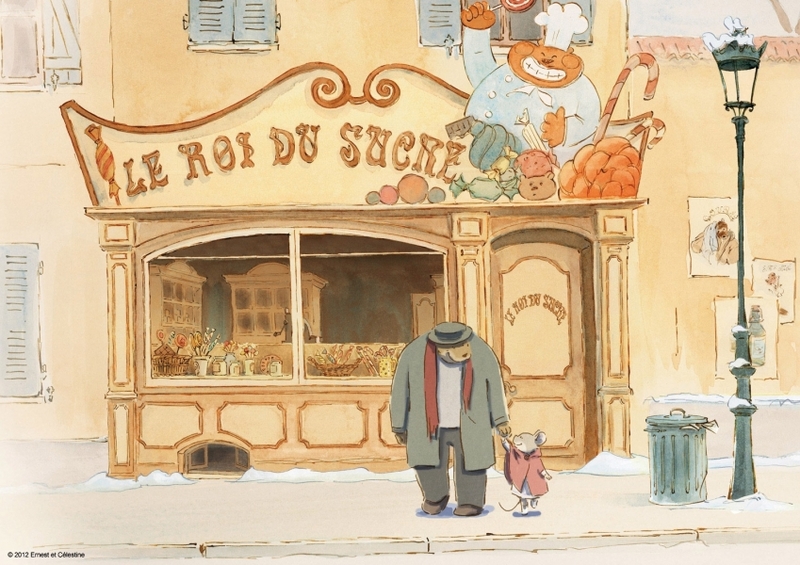 The animation, done in a sumptuous broken-line storybook-style watercolor, is outstanding. Despite the rumors of its demise, 2D hand-drawn animation isn’t dead, in fact it’s becoming vital again in Europe, and this is a brilliant example of what it could be again. We’ve all proposed to someone we barely know as a joke, right? Growing up, the movies we watched taught us that you can get to know a person intimately enough to marry them in a single day. Love is magic and predestined and nothing ever goes wrong. In the movies, when you ask a girl you barely know to marry you, she says yes and you go forth and have wonderful times together. So there is no reason to doubt the strength of Pete (Matt Mider) and Sophie’s (Noël Wells) engagement. Someone should tell that to Pete’s little sister, Jess (Amanda Bauer) who mocks their coming nuptials when the three get stranded outside of Phoenix during a road trip. Even for a low budget indie, Forev is a kind of dumpy film. It’s the kind of film that feels like a bunch of friends got together over a few weekends with someone’s dad’s DV cam and banged it all out on the first take, just for fun. From the surface look of it, I was prepared to be underwhelmed. But then something happened: I laughed. And I laughed again. Though some of the drama in the middle is a little on the stock side, Wells and Mider’s genuine and surprising on-screen chemistry, and Green and Leffler’s subtle, biting script bring it back from the brink. It doesn’t outdo Eternal Sunshine as commentary on the recklessness of movie romance on real romance, but it has plenty to say on the subject. The story for Winter in the Blood is taken from James Welch’s novel of the same name which won him some acclaim when it was published in the mid-70s. 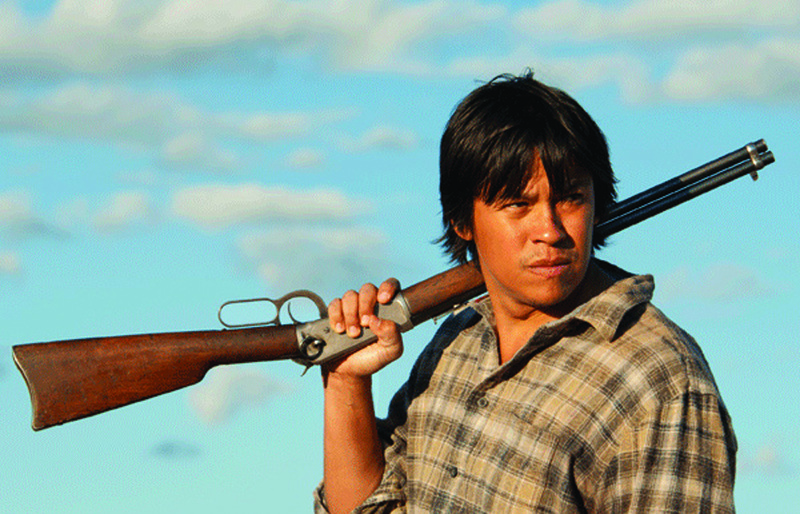 It is both an intense, personal journey of a man trying to find a place in the world that has given him nothing but pain, and a sweeping microcosm of the modern struggle Native Americans face to find a place in a world taken from them inch by inch and mile by mile. But what sounds like a powerful film on paper falls apart in execution from page to screen. I hesitate to use the word “adapted” because the Smith Brothers and their co-writer Ken White have not really adapted this into another art form as much as they have tried to film it as a moving book. As a film, it plays like a series of sketches taken from the novel. Voice over and music by the Heartless Bastards are attempted as storyteller’s glue, but it doesn’t adhere. Each scene feels so artlessly slapped together in random order that it’s difficult to engage head on — and if any story needs to be engaged head on, it’s certainly the story of America’s original sin. There are worthwhile scenes, and the mood is occasionally affecting, but it doesn’t come together as singular piece overall and that’s too much to overlook. Characters don’t have to be sympathetic for art to be good. They don’t even have to be likable. History is littered with the despicable and despised. To empathize with a character is far more important. But in Mark Raso’s Copenhagen there is nothing empathetic, sympathetic or likable about William, a 28-year-old American backpacking in Denmark after the death of his father. William is played by Gethin Anthony (Game of Thrones’ Renly Baratheon). In Copenhagen he explores the same bottomless pit of contemptibility as Joffrey Baratheon as he searches Copenhagen for his grandfather to deliver an angry letter that his father wrote him but never mailed. While searching, he runs into Effy (Frederikke Dahl Hansen), a beautiful young girl who helps him navigate the Danish geography and language barrier. As the two search, they fall for each other. Deep. There is just one small catch. She’s younger. Much younger. Like, 14 (about to turn 15!). You’ll remember above, where I said William was 28, though he doesn’t. It’s nearly impossible to buy Hansen as a 14-year-old though. She is 19 and looks it. It doesn’t make William any less terrible, but the film is about him growing up and coming to terms with the fact that having a terrible family doesn’t mean you have to be terrible too. Raso gets stuck in indie trope hell though, and can’t find his way out. Hansen is the film’s only redeemable quality; it’s a shame that she is wasted on this pointless search.